ATZ is happy to see Coney Island’s small businesses alive and kicking in the first year of Coney Island’s predicted rebirth. 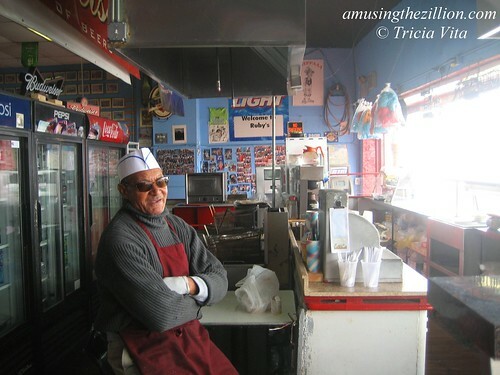 The good news is that all of the familiar mom-and-pop shops, bars and eateries on Coney Island’s Boardwalk are back in business for the 2010 season. The big difference is real estate speculator Joe Sitt is no longer their landlord and unlike previous years, they didn’t suffer a rent hike. 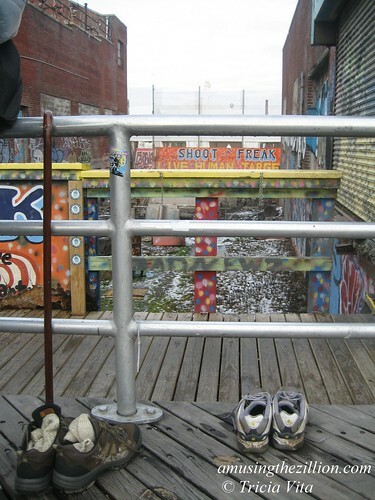 When the City of New York bought 6.9 acres of Coney Island property from Thor Equities in November, existing tenants on the Boardwalk were offered a one-year lease at last year’s rate, including one tenant who’d famously gotten the boot from Thor: The Lola Star Boutique. We’re thrilled that Lola aka entrepreneur Dianna Carlin is back in her original location next to Ruby’s after a one-year absence. Carlin, the founder of Save Coney Island, had not been offered a lease in 2009 by Thor because of her outspokenness on Coney Island development issues. Lola Star’s Dreamland Roller Rink, located in the Childs Building on the Boardwalk and leased from Taconic Investment Partners, will reopen next month. (Update 5/16: The roller rink will NOT return to Coney!) Other returning Boardwalk businesses scheduled to open in the coming weeks: Pio Pio Rico–“The House of the Best Peruvian Rotisserie Chicken”— located in the former Astroland arcade, Beer Island, and Nathan’s Famous Boardwalk location. Paul’s Daughter, Gyro Corner, Ruby’s Bar & Grill, Cha Cha’s, Steve’s Grill House, Rosa’s Tacos & Juice Bar and the Coney Island Souvenir Shop next to Ruby’s are already open daily. Weather permitting, of course. The Lola Star Boutique and Shoot the Freak are currently open weekends. 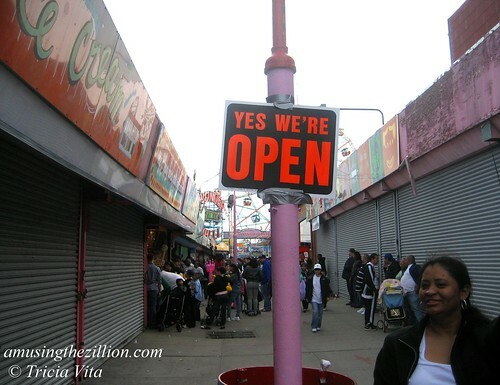 Also open daily in Coney Island: Nathan’s Famous original location at Surf and Stillwell, Williams Candy, Coney Island Beach Shop and the WCS New York Aquarium. On Wednesday, a painter was touching up the sign at Steve’s Grill House. ATZ observed many people out and about on the Boardwalk. We chatted with several British tourists who’d been stranded in New York by the volcanic ash cloud. 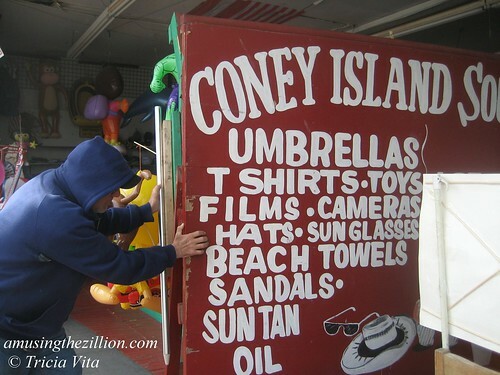 It was a sunny, breezy afternoon until rain sent everyone scurrying for cover and the Coney Island Souvenir Shop wheeled in their sign. 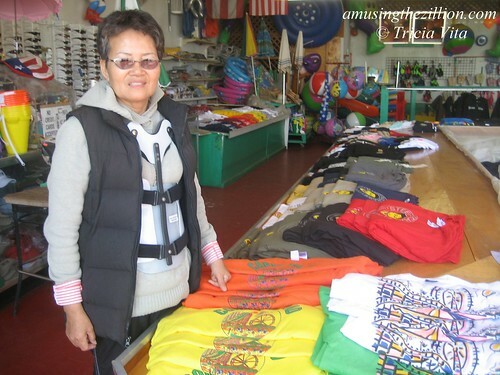 Coney Island Souvenir Shop owner Tom Suh died in a car accident in March and is much missed by his Coney Island friends and family. On Easter Sunday, we offered our condolences to Mrs. Suh, who is recovering from the accident, and son Rob, who is carrying on the family business. Last Friday, it was decidedly chilly in Coney Island, yet a photo shoot with a bikini-clad model was in progress on the Beach. We ducked into Ruby’s Bar and Grill, where it’s cozy and Beato was manning the grill. Did you know that Coney Island Boardwalk’s oldest bar and grill is among the Travel Channel’s “Top 21 sexiest beach bars”? Ruby’s has a brand-new website at www.rubysconeyisland.com or follow their Facebook fan page for news of upcoming events. 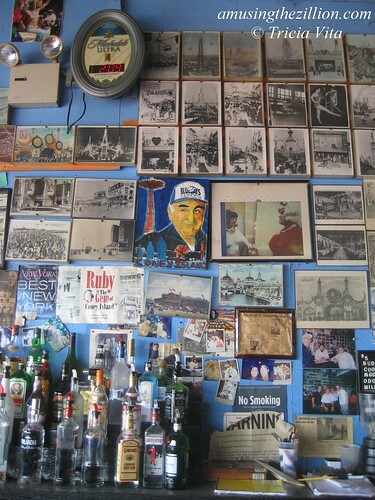 Ruby’s namesake–Ruby Jacobs–bought the bar in 1975. That’s his portrait with the Parachute Jump amid the vintage photos on the oft-photographed wall. After Ruby’s death in 2000, West 12th Street was named Ruby Jacobs Way in his honor. His daughters and son-in-law continue to run the family-owned business. Cheers to Coney Island’s 2010 season! 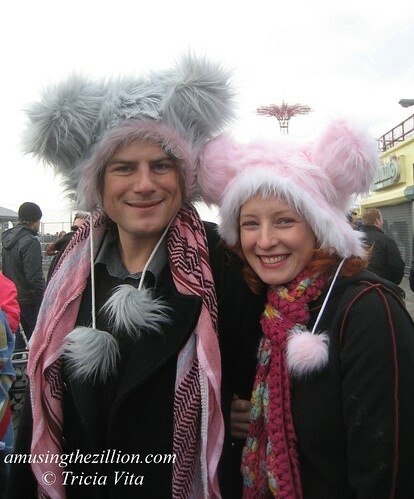 February 7, 2010: Coney Island Valentine: Get a Sea Lion Kiss at New York Aquarium! 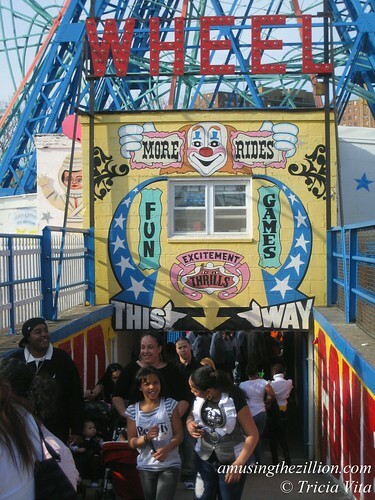 On Sunday, Coney Island enjoyed the busiest Easter in memory! 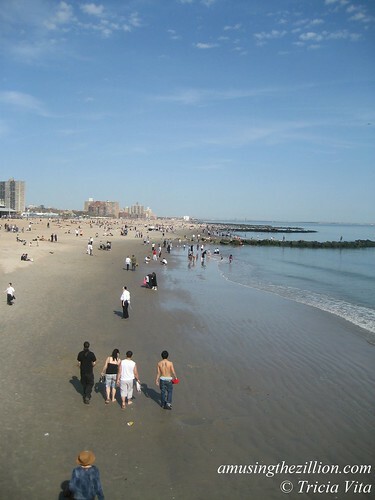 Thanks to the perfect weather– sunny and in the 70s– the New York tradition of the masses coming out to Coney to celebrate springtime is alive and well in 2010. Tweeps were saying “its poppin out here. Just like old times.” We kept an eye out for “Easter fresh” outfits. Bunny headgear won bonus points. The kids walked away with the prizes. 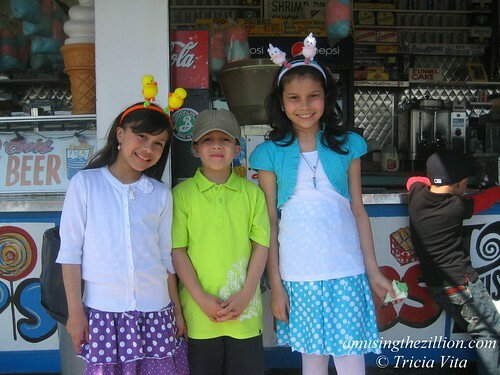 More pix in our flickr set Easter in Coney Island 2010. Astroland closed in 2008, but your kid can still ride the USS Astroland on the kiddie boat ride in Deno’s Wonder Wheel Park. 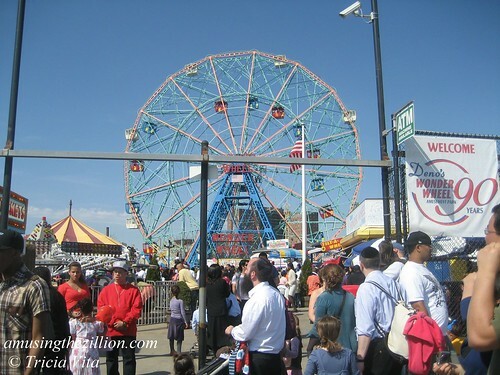 Coney Island currently has 40 rides including the Cyclone roller coaster, Deno’s Wonder Wheel Park (22 rides), McCullough’s Kiddie Park (a dozen rides), the Polar Express and 12th Street Amusements (5 rides) and the Eldorado Bumper Cars. The Boardwalk was a People’s Parade on Easter Sunday. Lines were long at ticket booths and rides were jam packed from noon till nearly midnight! 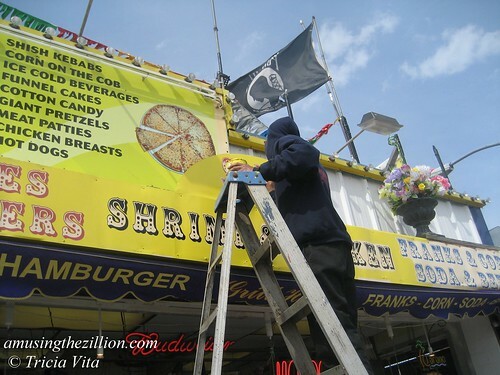 Coney Island USA staged their first freak show of the season and Lola Star reopened her boutique on the Boardwalk. “Yes, We’re Open!” a defiant sign planted on Jones Walk proclaimed. Never mind that several stands on the Walk including Thor Equities’ property on the west side remain shuttered. Joe Sitt, the Grinch who stole Coney Island with the Christmas Eve Lockout of 2008, did not steal Easter 2010. Paul’s Daughter, Coney Island’s iconic Boardwalk food stand, is open year round, weather permitting, and has the same delicious fries as when it was called Gregory & Paul’s. When we went by late one day last week, the stand was closed but Rafael and another employee were busy refurbing the cash registers for the new season. 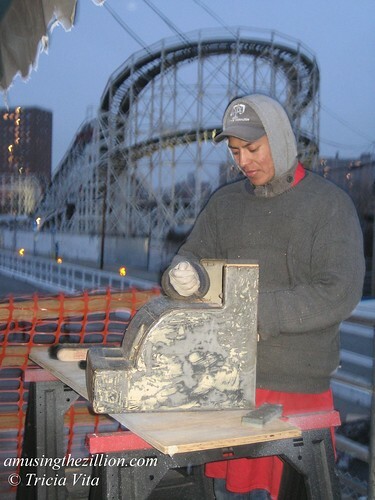 Workers at the Cyclone Roller Coaster, seen in the background) and Deno’s Wonder Wheel Park were also busy getting ready for opening day, which is now just a dozen days away! Coney Island’s 40-plus rides and diverse attractions open for the season on Palm Sunday, March 28th. The next weekend, Easter Sunday, is historically one of the biggest days of the season. Easter ranks right up there with Mermaid Parade Day and the Fourth of July. Coney’s new Luna Park, with 19 rides from Zamperla, is scheduled to open on the former Astroland site on Memorial Day Weekend. We’re hoping for great summer weather and the best season in a long time. 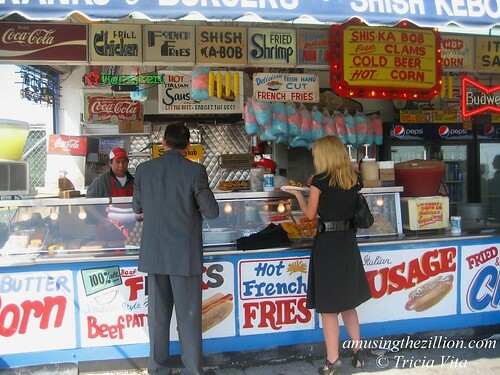 May the cash registers ring like crazy in Coney Island in 2010! July 10, 2009: Coney Island Fireworks: Free Show Every Friday Night All Summer Long! 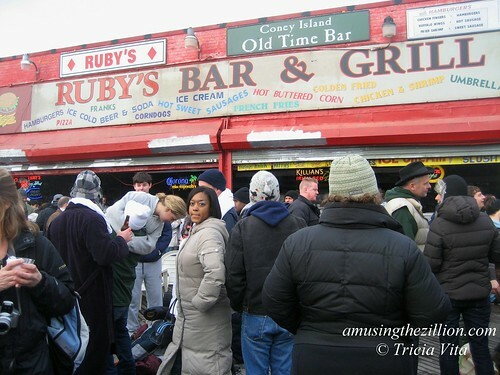 After the January 1st Coney Island Polar Bear Club Swim, the Bears and Cubs and everyone else who’d come to celebrate New Year’s Day on the Beach and Boardwalk gathered in and around Ruby’s Bar. Here are a few pix of Coney Island luminaries, friends, strangers and their pets enjoying the occasion and the warmish weather. 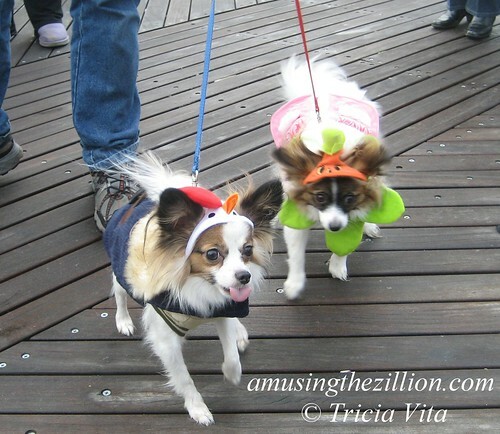 Coney Island entrepreneur Dianna Carlin aka Lola Staar and Raja Azar of Jollyship the Whiz-Bang were wearing the most adorable matching hats. The top of the Parachute Jump appears to be part of Lola’s hat! Is that freaky or what? Dianna is looking forward to a lease from the City in February 2010 for the Boardwalk spot next to Ruby’s where the Lola Staar Boutique thrived until Thor Equities evicted her in 2008. Lola’s Dreamland Roller Rink in the Childs Building on the Boardwalk at 21st Street will open for its third season in the spring. Bow-wow! New Year’s Day doggies all dolled up for a stroll apres the Polar Bear Swim. ATZ arrived too late to see Target the famously friendly Coney Island Arcade Cat take a little walk on the Boardwalk. Among the friends with whom we exchanged New Year’s greetings in front of Ruby’s were Target’s owner, Manny Cohen of Coney Island Arcade; Stan Fox, Coney Island Arcade and the Coney Island History Project; Mark Blumenthal and Ruth Magwood of the Cyclone Roller Coaster; Benny Harrison, Jones Walk game operator; Coney Island photographers and ATZ contributors Bruce Handy and Norman Blake; and photographer Lou Dembrow of the Lower Eastside Girls Club. Happy New Year Everyone! Happy New Year to Coney Island! Hanging out at Ruby’s Bar & Grill is both a summertime must and a New Year’s Day tradition. 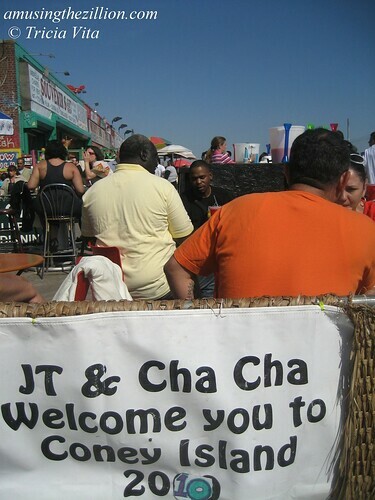 The joint was jumpin, inside and out, with a live band performing on the Boardwalk. Wish we hadn’t just missed the photo op with Ruby’s owner Mike Sarrel after he got back from a good luck dip in the ocean. Here’s to another great season at Coney Island’s oldest bar on the Boardwalk! Summer or winter, dancing on the Boardwalk is a Coney Island tradition, too. The contrast between this guy’s wacky costume and the gal’s everyday attire is what caught our eye. When we got to Ruby’s, the first person we noticed was somebody’s wonderful Grandma (wish she were ours) sitting at a table by herself watching their stuff. She was wearing a pair of glittery gold 2010 specs. 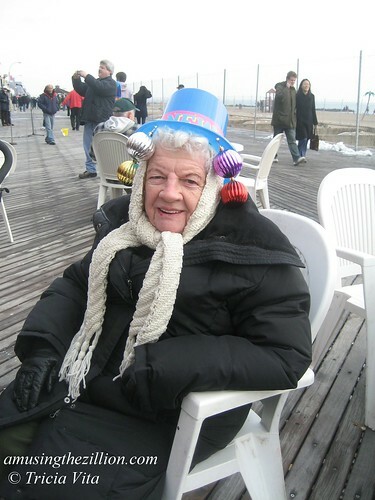 Do you think she would mind if we adopted her as ATZ’s honorary Grandma of New Year’s Day? Wet sneakers parked at Shoot the Freak apres swim while their owners party at Ruby’s. Congrats to all the Bears and cheers to all who contributed to Freezin’ for a Reason. More than $27,000 was raised by the Coney Island Polar Bears for Camp Sunshine. There’s still time to send in a check! John D’Aquino was part of the dive team that raised the century-old Dreamland Bell from the ocean this summer. 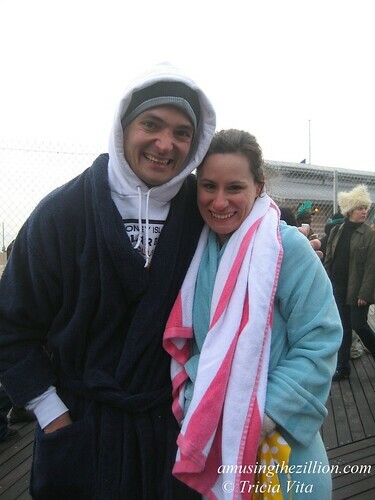 John, who swam today with his girlfriend Jamie Segschneider, has been a member of the Coney Island Polar Bear Club for a decade. If you missed the New Year’s Day Plunge, there’s always next weekend. The oldest cold-water bathing club in the U.S. goes for a dip in the Atlantic at 1 pm every Sunday from November through April. See you on the Beach! 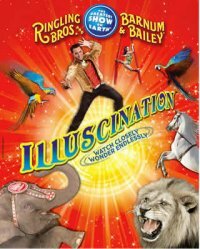 Today, Ringling’s magical new show starring “thrillusionist” David DaVinci, an aviary of macaws, doves, and free flying parrots, a trio of Italian clowns, and much more will premiere in West Palm Beach. Stay tuned for our upcoming preview of the show. 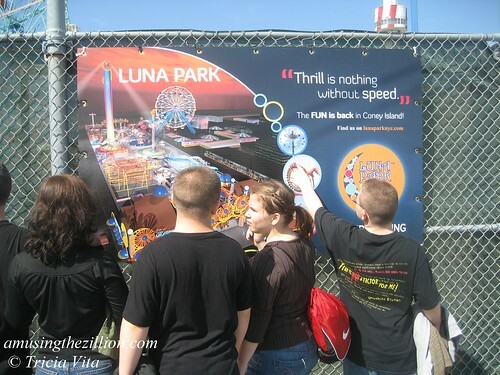 Come summer, Feld Entertainment is expected to bring the Gold Tour #4 to Coney Island after the successful 12-week run of their Coney Island Boom-A-Ring in 2009. “I was down in Florida for rehearsals of the new Gold Unit last week and I have to tell you – it’s spectacular!” says Steve Yaros, Vice President, Event Marketing & Sales, Northeast Region at Feld Entertainment. Yaros has been working with Taconic Investment Partners to secure the lot at 21st and Surf where Ringling raised its blue and yellow striped tent last summer. ATZ had heard the circus performers were telling friends they’ll be in Coney over the summer. Come visit! When we asked Yaros, he said a deal has yet to be made. We’re optimistic, too. Last summer’s Coney Island Boom A Ring brought The Greatest Show On Earth back under “The Big Top” for the first time since 1954 and attracted over 160,000 visitors in its first year in Coney Island. The Coney Island community–those of use who live or work here–are of course thrilled to have Ringling return with a new show. The circus folk were great neighbors and partners in helping us publicize the fact that Coney Island is Really Fun and Really Open. We’re optimistic since Ringling wants to come back and Mayor Bloomberg wants the circus back and the Mayor is known for getting things done. “The City is looking forward to a vibrant summer in Coney Island in 2010, and we hope that the Ringling Brothers Circus will be part of it,” says Libby Langsdorf, assistant vice president for public affairs at New York City Economic Development Corp. (NYCEDC). If ever there was a time to end the school bus parking blight in the People’s Playground, it’s now. There are already too many pix of yellow buses popping up in visitors’ flickr sets of Coney Island. If you think we’re exaggerating, take a look. Visitors wonder why all the school buses on earth are parked there. 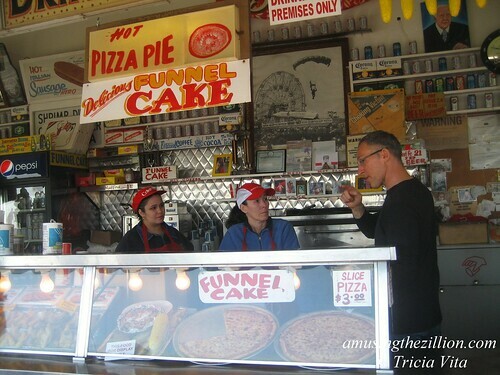 It’s a surprising thing to see in the heart of Coney Island, so they snap a picture. Memories are made of this. There are actually two bus lots–one on property owned by Thor Equities adjacent to Nathan’s and one further west on Taconic’s property. Let’s exile the buses on Thor’s property while we’re at it and replace them with….rides! The unamusing buses have long term leases to park on the empty lots despite the fact that the area was zoned for amusements. The photographers’ captions say it all: A bus station, a school bus graveyard, Coney Island School Bus Depot and School Bus School Bus School Bus School Bus School Bus School Bus. 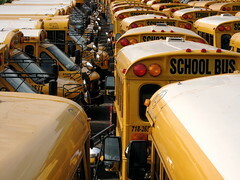 If anyone knows of an empty lot where the throng of school buses can go on permanent vacation from Coney Island, please let us know! Or better yet, let the City know. See you at the circus! Goodbye school buses! Hello Ringling Bros and Barnum & Bailey! It’s finally official: Feld Entertainment issued a press release today announcing The Coney Island Illuscination. The show will run from June 17 through September 6, 2010.